Is it ever going to change? Probably not. 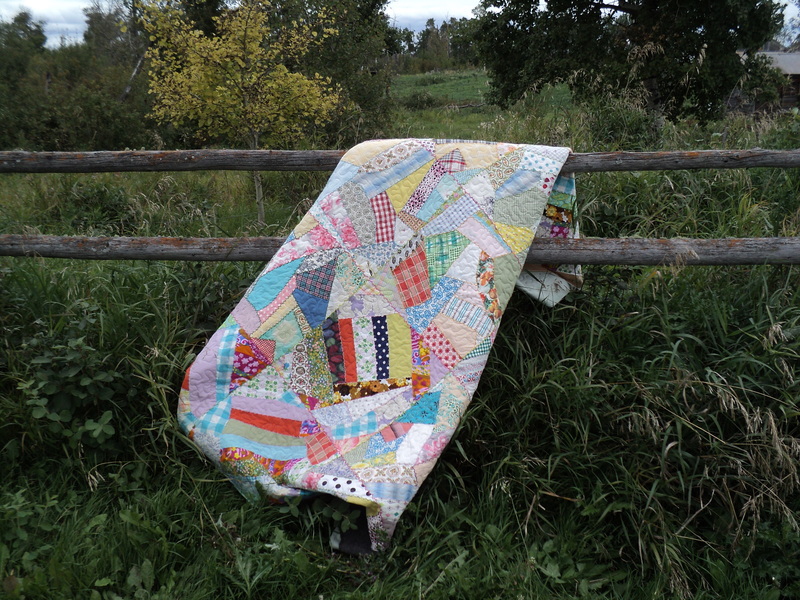 I got this beautiful quilt top from the lovely Diane S. at the beginning of summer. i JUST delivered it today. I am a terrible person. Being the sweet lady she is, she didn’t give me any grief about the length of time i had the quilt. It’s all done now, and I’m pretty happy with how it turned out. 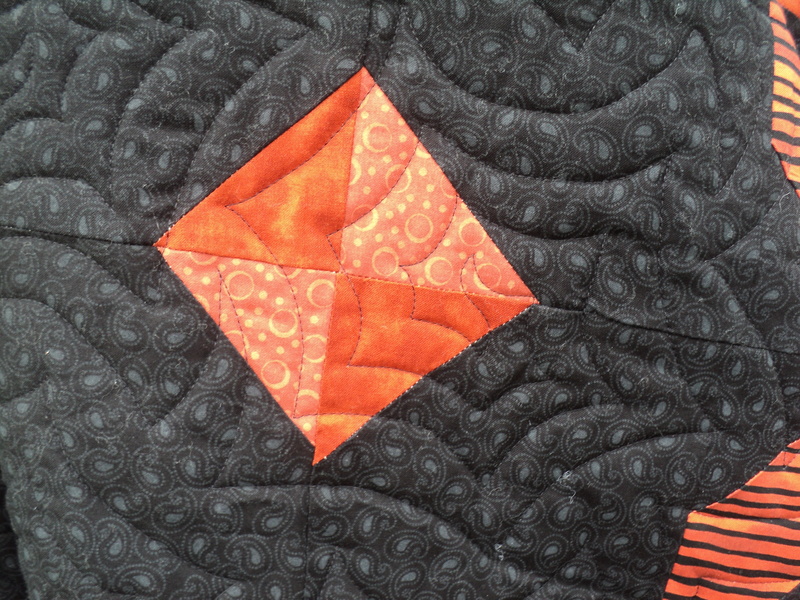 Diane made this quilt for her teenaged grandson, so I used the Gossamer pantograph from Lorien Quilting to keep it a little more masculine. I used Connecting Threads Essential Pro thread in Black on the top, and Magna-Glide Classic in Black in the bobbin. As per usual, my APQS Lucey stitched beautifully! Overall, I think it turned out pretty good, and I hope Diane’s grandson enjoys it! School has started again, and my wee man is in Grade 2. Tomorrow, my littlest man starts pre-kindergarten. It’s a bittersweet day for me. I am looking forward to having some “free” time, but I am sad that my baby is growing up so fast. I have my day planned so that i won’t be home, alone, listening to the clock tick and ugly crying at my kitchen table. A few weeks ago, I put an ad up in the local buy and sell asking for free or very cheap sewing machines, and i have three to pick up tomorrow. my plan is to clean them up, tune them up, and donate them to people who need a machine, but can’t afford to buy themselves one. I’ve done this a few times in the past, but am looking to donate to a organization that is able to distribute them for me. A friend of mine steered me to an organization in a neighbouring city that I hope will be able to find the machines a good home. I’ll let you know how it goes. 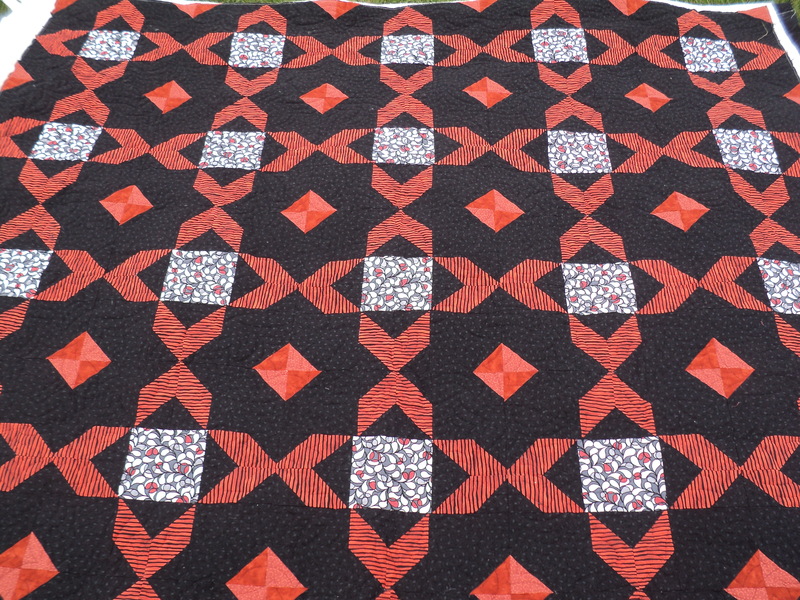 I also have a BEAUTIFUL quilt to drop off for a lovely lady named Diane. 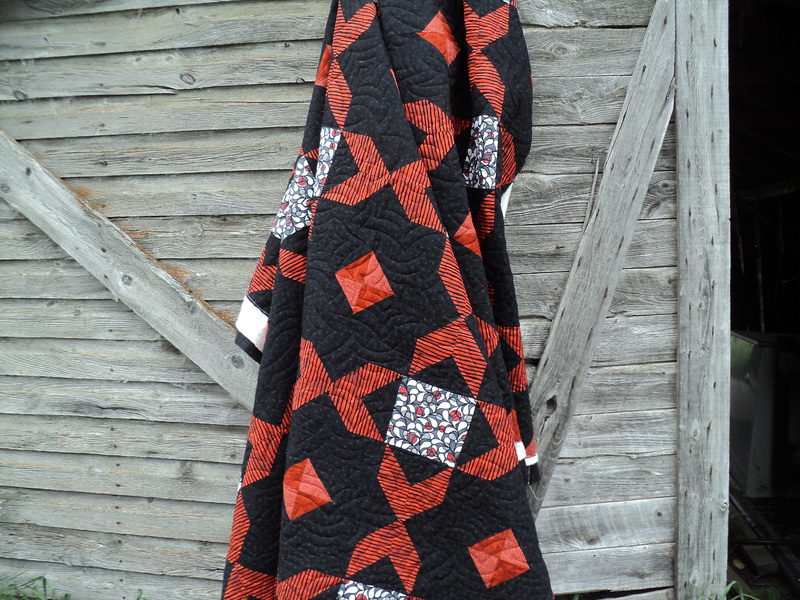 She contacted me several weeks ago about quilting a crazy quilt she had rescued from a thrift shop. I got it on the frame yesterday, and spent the day getting it done. It’s such a beauty, i don’t want to give it back! Shhhhhhhh! Don’t tell her! 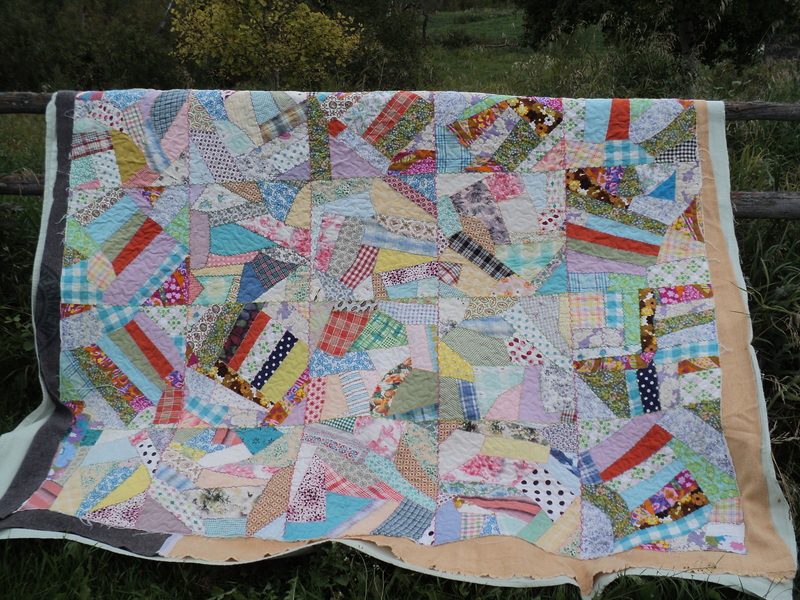 The quilt was foundation pieced onto white broadcloth and was originally tied with acrylic yarn. i have no idea when it was put together, but whoever made it was probably a seamstress. The fabrics run the gamut, from cotton to nylon to polyester in every weave and weight you can imagine. The maker also embroidered over each seam using a herringbone stitch and a different colour floss for each block. Unfortunately, the poor thing has seen better days, with some of the embroidery missing, and a few patches that are threadbare or full of holes. I’m confident it’s gotten a new lease on life, and I hope it lasts for many more years.I quilted it with white thread in an allover meander, as I didn’t want to take away from the fabulous fabrics. Also, i wanted to be at the front of the machine (instead of the back as I would have been had I done a pantograph) so that I could watch for any delicate areas, and avoid catching the hopping foot on any embroidery, or popped seams. I used a flannel sheet for the backing, and two old wool blankets for the batting. 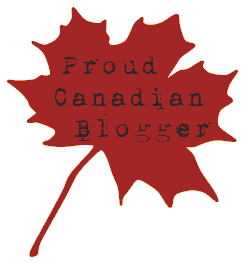 I wasn’t sure if I would have any issues, but of course, my Lucey stitched like a dream and it looks wonderful! it’s very heavy (in a good way) and I know Diane will be extra cozy snuggling up in it this winter.